World 5-Castle is the sixth and final level of World 5 in Super Mario 3D Land, and the second castle to appear in the game. A Fake Bowser is once again faced as a boss. 50 Star Medals are required to access this level. 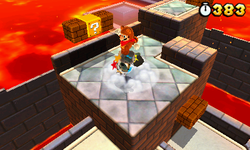 In the start of the level, Mario sees two Brick Blocks and going up on a elevated floor, he faces a Dry Bones. Near this place, he must go up on moving sinking platforms under a swinging spiked cylinder and a Baddie Box. A cement area is found, where Mario encounters Brick Blocks, a Draglet and three Thwomps. Going to the far right, Mario must ride wire moving rotating platforms, under another Baddie Box and a Red Ring. Jumping to a stone area, he sees three Lava Bubbles, a Checkpoint Flag and a pair of Binoculars. On the left side, there are more moving platforms and Thwomps. Soon after, a stationary ground with another Draglet and a Hammer Bro is there. After crossing rising boards and Lava Bubbles, the fake Bowser battle starts. The corridor is composed of moving platforms, cement floor and a bridges. After Mario hits the switch, he saves the two Toads (Green and Yellow), and finally the fake Bowser is revealed to be a Magikoopa. He must go in a warping block to reach on the top of a tower, where a + Clock and the Goal Pole are standing. Star Medal 1: The first Star Medal is located on the second Thwomp near the middle of the level. Star Medal 2: Directly after the first Star Medal, the second Star Medal can be obtained by jumping south of the moving platforms, while avoiding the lava. Star Medal 3: After passing the checkpoint, the player is on another set of moving platforms. At the end, the third Star Medal can be nabbed by jumping right before the platform enter the lava.